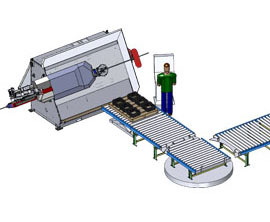 The KRB Stirrup Conveyor allows stirrups to moved away from the bending area and staged to awaiting trucks for loading. The ergonomic design of the lift table allows the operator to stack parts without bending over. The system can be configured in powered and non-powered configurations to meet your needs. Reduce operator fatigue and keep your automatic stirrup bender producing parts. No more waiting for material to be moved away. Another solution to increase safety and eliminate bottle necks in your shop.